According to Jacksonville Electric Authority (JEA), fifty percent of the average homeowner’s monthly energy bill goes to air conditioning due to inefficiency. While this is true, most homeowners do not realize the mistakes they are making with their A/Cs which can undercut both efficiency and safety. 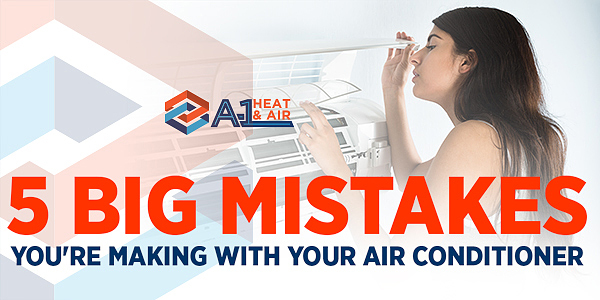 Save money and time by avoiding these five big mistakes you are making with your AC. A non-programmable thermostat can be ineffective because you have to manually adjust the temperature while you are in or before leaving the house. Do you have a sound mind to do it every day? If no, then a programmable thermostat is the one you should get! Installing a programmable thermostat will save you thousands of dollars on your energy bill. A Wi-Fi thermostat automatically lowers or raises the temperature while you are away. When it comes to yearly maintenance, it is important to escalate the problems to experts. Professional A/C contractors can handle everything you need, from complete system inspection and repairs to new installation and more. Annual maintenance will save you from surprise unit breakdowns and costly repairs. Air filters are among the essential components of your air conditioning unit. With dirty air filters, you are putting everything at risk. As a result, airflow is restricted, your health is compromised, and your system lessens its efficiency. Experts advised that air filters should be replaced once every three months or as necessary, depending on how frequent you use the system. It might be tempting to entirely turn your AC unit off when the entire family spends a long-week vacation. To tell you, it is a bad idea! Your home would practically turn tremendously hot. Over time, heat can build up which comes with serious consequences. To avoid this, you can set your thermostat up to 85 degrees. A day before your return, you can reset it to 70 degrees to make it more comfortable once you get home. The position of your outdoor A/C has something to do with energy usage. Your unit will work even harder when installed in direct sunlight. Instead, place your unit in a shady area to maximize its efficiency. Also, your indoor thermostat should be positioned away from any heat-emitting appliances so it can work properly. Do you want an air conditioning system that runs efficiently? Don’t delay it! Call our experts at A-1 Heat and Air Conditioning and enjoy the benefits of a properly working air conditioning.